April 14, 2019 at 12:59 am. 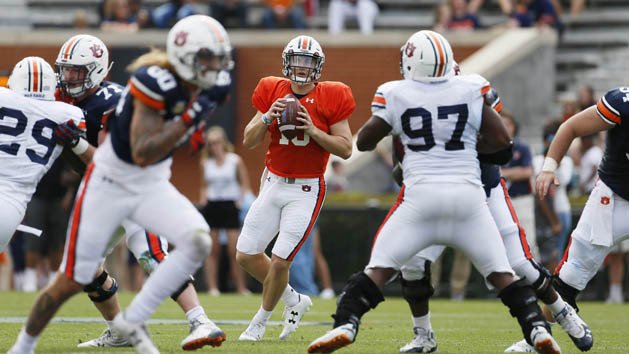 AUBURN — If Auburn is going to be a contender in the rugged SEC West this fall, it will have to get steady quarterback production from a player with virtually no starting collegiate experience. 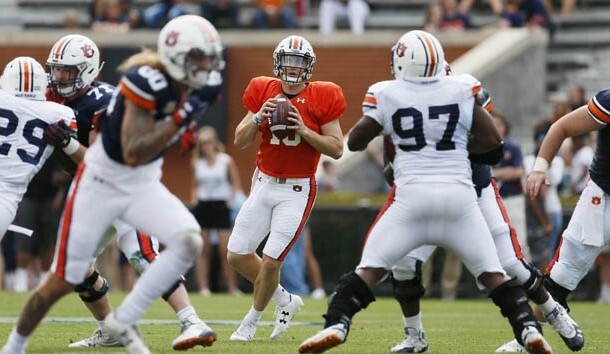 If Saturday’s A-Day Game performances by Malik Willis, Joey Gatewood, Bo Nix and Cord Sandberg are any indication of what’s to come, then the Tigers seem to have a few candidates poised to make that happen. Willis, Gatewood, Nix and Sandberg all had their moments in the team’s annual spring game, but the efficiency of the group was evident in the numbers. The quartet completed 29 of 36 passes for 267 yards and four touchdowns in the first half, which led to a 28-10 Orange lead — the eventual final score. Willis, a 6-foot-1, 193-pound junior, began the A-Day scoring when he connected with redshirt freshman Matthew Hill on a well-executed 41-yard touchdown pass to give the Blue team a 7-0 lead with 7:38 to go in the first quarter. Willis finished the afternoon by completing 7-of-8 passes for 63 yards and a score. Hill, who also hauled in a 49-yard touchdown reception from Nix with 37 seconds left to go in the second quarter, could be a major contributor to the Auburn receiving corps this fall. The 6-1, 193-pound wideout from Lawrenceville, Ga., had five receptions for 128 yards and two TDs playing for the Orange and Blue teams. Following the nice catch-and-throw from Willis to Hill, Nix responded by leading the Orange team on a 10-play, 70-yard drive to tie the game at 7. The scoring march was capped by an 11-yard scoring toss by Nix to senior wideout Eli Stove. Nix, one of America’s top prep QB prospect’s in 2018 and an early enrollee, flashed nice elusiveness while under duress on several occasions throughout the game. He completed 11 of 14 passes for 155 yards and two touchdowns in his first two quarters of college football action. Although Nix failed to complete a pass for the remainder of the game, his effort following a mistake showed his character as a player. With 6:41 in the third, Nix, following his first pick in an Auburn uniform, made a B-line toward redshirt freshman linebacker Michael Harris in an attempt to make the tackle. And although he didn’t make the stop, Harris eventually fumbled the ball and the Blue team offense, which Nix was directing, regained possession. Sandwiched in between the Nix scoring passes were two efficient drives by Gatewood, a 6-5, 237-pound dual-threat option who redshirting a year ago. Gatewood, a St. Augustine, Fla., native, completed 7-of-10 passes for 123 yards and two scores in the first half. He connected with Williams on two impressive scoring tosses of 11 and 29 yards in the second quarter to put the Orange up 21-10. Redshirt freshman Cord Sandberg completed all four of his passes for the Blue team. He completed 4-of-5 for the Orange team. Williams, the A-Day Game Offensive MVP, was a man among boys in jump-ball situations. On his two scoring plays, his athleticism simply overwhelmed the coverage. He finished the game with four catches for 103 yards and two TDs. In addition to the Auburn’s QBs and wideouts making noise, the offensive line, a position in flux a year ago, looked better. The unit opened up some nice holes for running backs JaTarvious Whitlow, Kam Martin and D.J. Williams. The unit also performed well in pass-pro. Whitlow, a sophomore, led the Orange team with seven carries for 44 yards (6.6 avg.). True freshman D.J. Williams led the Blue with 10 carries for 56 yards. His physical running style should be a welcome addition to the Tigers backfield depth. Redshirt freshman halfback Harold Joiner, a former Mountain Brook High School standout, had nine carries for 49 yards while seeing time on the Orange and Blue teams. Senior defensive tackle Derrick Brown bagged the A-Day Game Defensive MVP Award after he recorded four tackles and two sacks in the first half. Sophomore corner Noah Igbinoghene and senior safety Daniel Thomas tied for the Orange lead with four tackles. Thomas was in solid position on a number of QB-keeper zone reads that were run throughout the duration of the game. Junior BUCK end T.D. Moultry had three tackles, including two for loss, for the Orange team defense. Sophomore safety Jamien Sherwood led the Blue team with seven stops. Former Opelika star Devin Guice made some nice plays from his defensive back position. He tallied four tackles, which ranked behind only Sherwood. Junior punter Arryn Siposs placed three punts inside the 20-yard line on special teams. Sophomore kicker Anders Carlson, the Special Teams MVP, hit a 46-yarder and all four of his extra point attempts. The second half was focused mainly on running clock and giving the team’s inexperienced players a chance to gain some experience in front of the home fans. Auburn opens the 2019 season against the Oregon Ducks on Aug. 31 in Arlington, Texas.